*Green tea has been recognized for centuries as having relaxant properties. Pure Encapsulations l-Theanine, a unique amino acid derived from tea, provides the characteristic taste of green tea. Pure Encapsulations l-Theanine has also been discovered as the biologically active constituent of green tea responsible for promoting relaxation. In a preliminary non-clinical study, an l-theanine solution enhanced alpha wave production in the occipital and parietal regions of the brains of volunteers. These observed patterns are considered to be an index of relaxation. Furthermore, it did so rapidly and without causing drowsiness. In two additional studies, alpha waves were also shown to be detectable soon after Pure Encapsulations l-theanine administration. Theanine is also useful for supporting healthy cellular function. Preliminary research suggests that Pure Encapsulations l-theanine may be helpful for premenstrual support including healthy attitude. Furthermore, theanine has been reported to moderate the effects of caffeine on the central nervous system. Pure Encapsulations l-Theanine's safety is supported in studies and by its long history of safe consumption in tea. 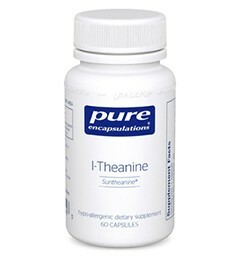 Pure Encapsulations l-Theanine is Suntheanine®, the brand which has been used in scientific studies.Pure Encapsulations offers Suntheanine® l-Theanine, a unique amino acid, providing helpful relaxation support without causing drowsiness and easing occasional nervous tension and irritability. l-Theanine is the most abundant free-form amino acid found in tea leaves. Suntheanine® l-Theanine is produced from enzymatic fermentation. Hypo-allergenic plant fiber is derived from pine cellulose.